- ☺ Effective Night Vision☺ Our doorbell adopt and IR cut and 6 high efficiency infrared lights to insure the clearence, even in the rainy dark night. 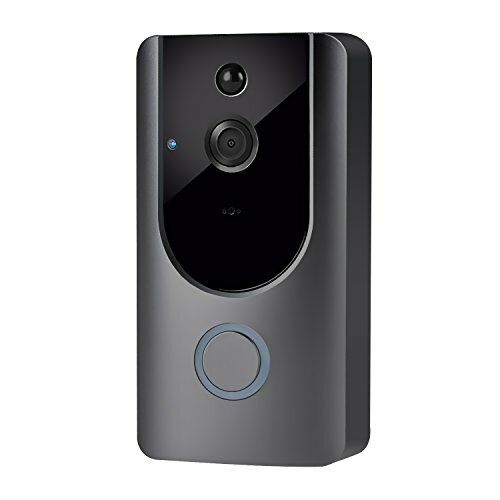 - ☺ PIR Motion Detection☺ At first,you should set the function through the app.Then if there's someone hovering at the door, the doorbell will take a photo and send message and photo to your phone.So that you could see who is at the door. If you haven't receive anything, please check if you allow the app to push notification. - ☺ WiFi Connection & 166 Degree☺ Just download the app and follow our instruction to connect your phone in one minute. The distance of Wi-Fi is about 33ft(10m) and 2.4G compatible (NOT 5G). The doorbell 166 degree wide-angel lens. - ☺ Rechargeable Battery & Longtime Stanby☺ The video doorbell work with two 2600mAH 18650 batteries which can be powered by both USB and CA so you do not need buy another charger.At the same time, It consumes low power so it can work for 8 months. (if everyday press 5 to 8 times). - ☺ Product warranty☺ Customer's 100% satisfaction is always our priority. We would like to offer you the unconditional 30-day money back guarantee and lifetime warranty to make it an absolutely risk-free purchase.